After years of trying to hear migratory birds flying overhead at night with limited success, this spring I finally got a microphone system and am able to enjoy migration on a whole new level! Below is a photo of my microphone setup, and Oldbird 21c microphone system. 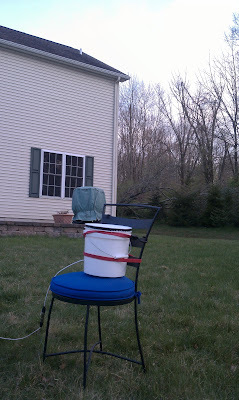 Eventually I will mount this on my roof, but for now it is on a chair in my backyard. I have an audio cable running from the microphone to my laptop inside, and use Easy Hi-Q Recorder to automatically record all night from 9pm to 5:30am. Then I use Tseep detector and Thrush detector software to scan the 8.5 hour recording and create short clips of possible bird sounds. I then use GlassOFire to create spectrograms of these sound clips so I can look at them and quickly delete those that aren't actual bird calls. 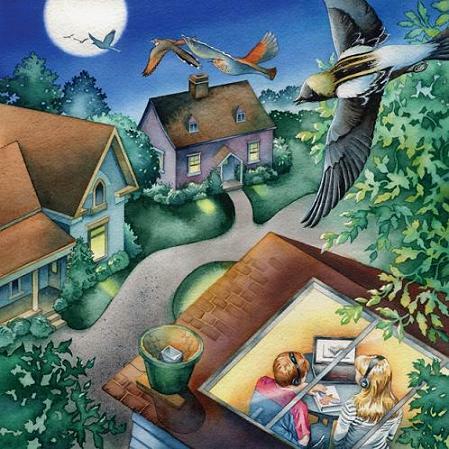 Flight Calls of Migratory Birds CD--a must have guide to the flight calls of eastern North American songbirds. 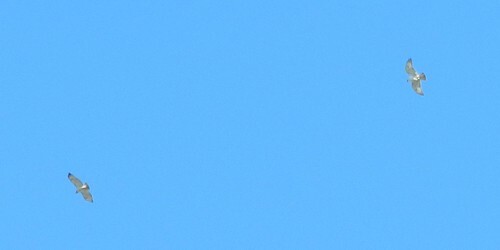 Bird Calls and Songs website--lots of audio of mostly eastern U.S. birds, including flight calls. 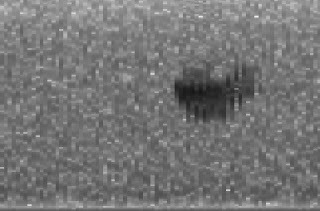 Nightmigrants.com--more clips and spectrograms for comparison. Call Notes and Flight Calls website--more call recordings from New York. Each night I can listen to the recording in progress, until I get too tired and head to bed. In the morning I analyze the calls and begin to sort and identify them. Migration is just starting to really get started here in western New Jersey, and we've had many nights of north winds and very little migration. Most nights I get just a handful of calls, but some nights have had over a hundred calls. It should get even better in the next couple of weeks. So what have I found so far? How about a bird that I would never otherwise get on my yard list--Virginia Rail. I actually recorded this bird twice in mid April! Most of the calls I've been getting so far are sparrows. Mostly White-throated Sparrows. 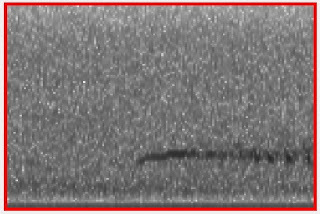 I'm becoming quite fond of this nice squiggly double line, the signature White-throated Sparrow spectrogram. But I've also starting to get some Grasshopper Sparrows and Savannah Sparrows--grassland birds that might never land in my yard, and I would be hard pressed to get on my yard list any other way. Here are a few of the warbler calls I'm starting to get. This little squiggle is apparently an Ovenbird flight call. After 30 years of birding, exploring this world of flight calls and squiggly spectrograms is like starting birding from scratch--it is a whole new world and while we've learned a lot about these calls, the study of night flight calls and nocturnal migration is still in its early stages--there is a lot to learn. So, what is flying over your house tonight? Perhaps you'll want to get yourself a microphone as well and join in the fun. 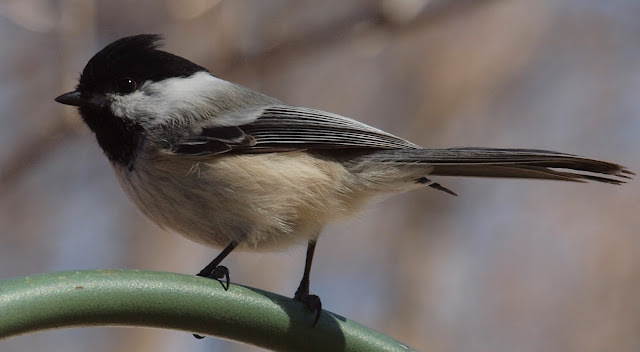 In addition to adding new birds to your yard list, you can develop a whole new appreciation for bird migration, learn some new state of the art bird ID skills, and perhaps even contribute new findings to this exciting and fledgling branch of ornithology! The following is a review of Derek Lovitch's How to Be a Better Birder. While there is no trick or fast-track to being a great birder, this book provides a lot of easy to follow and easy to practice methods to increase your birding skills and your enjoyment of birding. How to Be a Better Birder begins with a chapter on advanced field identification, with a focus on using a "whole bird and more" approach. 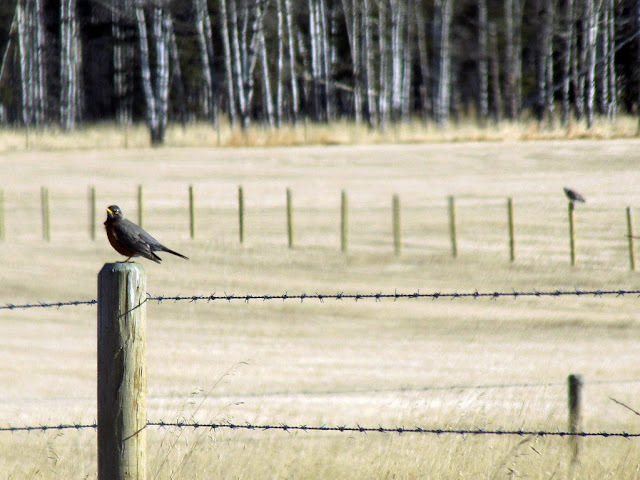 Using this method will help you identify more birds more often. 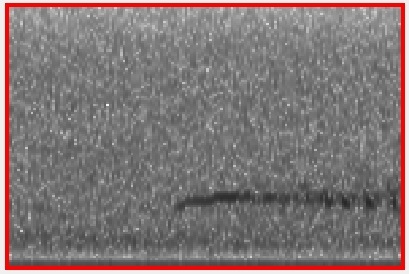 Nobody can identify everything all of the time, but with practice you can begin to identify birds based on movements and overall appearance versus obscure, often hidden field markings. Following advanced field identification, there are chapters on birding by habitat and birding with geography. These sections go hand in hand and are equally important for understanding what birds you will find where. With more knowledge on these topics you will improve your ability to identify more birds as well as discover those birds that are rare and out of the ordinary. Next there are chapters on birding and weather and birding at night. These two sections go into detail on how to use weather forecasting, radar, and more on how to predict and anticipate where birds may show up, mostly during migration. Websites and other resources are listed throughout for you to learn these tools more thoroughly. The chapter on birding with a purpose takes a different approach to the idea of "being a better birder". The focus here isn't necessarily building up your skillet but putting your growing skills to good use for conservation and citizen science. We wholeheartedly believe in this, although sometimes it is hard to follow through! The book ends with a chapter on "patch listing". Here Mr. Lovitch focuses on the joys and benefits from birding extensively at local spots or "patches". He has a few small parameters and sets goals to build patch lists and in doing so, is able to learn more about habitat, distribution, and the birds themselves. 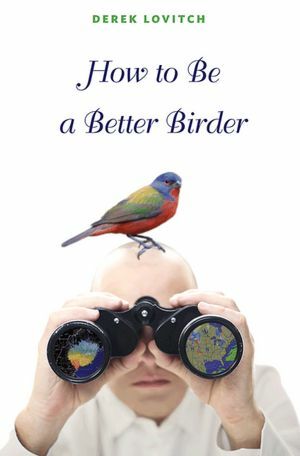 How to Be a Better Birder reaches a wide audience from beginner to expert. The tone and flow of the book allow you to gradually learn new methods to be a better birder. You're bound to find several nuggets of information that you can use today, tomorrow, and always in the search for more birds. Disclaimer: I received this book for free from the publisher and the review originally appeared on Birdfreak.com. 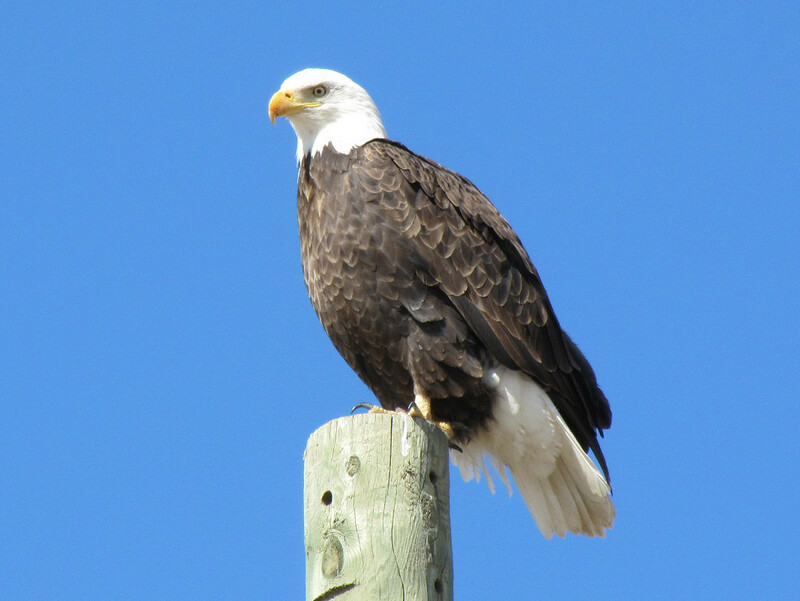 As a birder, I'm always happy to come home having seen wonderful birds and interesting bird behavior. But as bird photographer, I also want to come home with the best photos I could possibly take. When I began photographing birds, I had very little interest in getting dirty--even getting a little sweaty was somewhat irritating; I wanted to come home basically as I left--nice and clean. But now that I've been photographing birds for a while, I've realized there's a cost to getting the best possible photographs--bird photography may claim your cleanliness, and it may even claim a little bit of your dignity. I was at Mead Gardens near Orlando, FL yesterday morning. The Painted Bunting above was perched slightly higher than the floor of the boardwalk I was walking on, and she was perched so close to the railing that I knew if I walked close enough to get a clean shot she would fly away. Eventually I decided the only thing I could do is lay down on my belly right on the boardwalk and photograph the bird through the railings. Once on my belly, I inched closer to get the shot below. The other people there must have thought I was pretty strange, but I didn't mind sacrificing a little of my dignity to get the shot. Fort De Soto is one of my favorite places to get wet and dirty. The north beach area has both morphs of my favorite egret, the Reddish Egret. I was there in February while both were there in a shallow water pool. So I waded into the water and crouched down. I've found that if I stay low and still, these birds often don't mind coming relatively close to me. In fact, they sometimes come so close that I can't get their whole body in the frame. But to crouch down low in the water, I couldn't help but let the seat of my pants get wet. I'm sure I was a sight to behold when I left the pool, but I got some of my favorite shots of Reddish Egrets. Wilson's Plovers and Sanderlings were also there in abundance, but the only way to get the shots I wanted was to lay down in the sand, fully clothed. I spent the rest of the evening nice and sandy. On another day I was wearing long pants (like a fool). I decided to wade across a channel of water to another point of sand. I tried rolling my jeans up to get across to no avail. Eventually I just had to let the legs of my pants get wet. But this American Oystercatcher flew by me nice and close to congratulate me for my sacrifice. I tried to remember this as I walked around the park in sloshy pants. I nearly reached my limit when I was photographing a few Pine Warblers. In order to get this shot, I found myself covered in sand spurs. I do not have fond memories of removing these, but every time I look at my photos, I convince myself it was worth it. So how great a sacrifice is worth getting the shot? The temptation, I think especially for bird photographers, is to get as close to the bird as possible. The closer you are, the bigger the bird in your frame, and the better the shot. At some point, however, we're not just approaching a bird, we're disturbing a bird and disrupting its sense of normalcy. As photographers, we have a vested interest in keeping our distance, since if we disturb the birds, they will leave. So I keep a safe (even if wet, dirty and undignified) spot, and if they approach me, great. Otherwise, I don't want to sacrifice the bird's sense of safety for a shot. That ruins the experience not just for me now, but perhaps for other birders and photographers in the future. Two days ago, I found a tree with two Blue-Gray Gnatcatchers and one Northern Parula. Both species were buzzing around the tree. The Gnatcatchers were particularly bold. They frequently would fly out of the tree, catch a bug, and fly back. Sometimes they would fly just feet from my head. So I just stayed put. They felt safe, and I just stayed where I was and held the shutter down when the landed in a good spot. We had a great time. And in fact, this experience with the gnatcatchers and parula reminded me of one of the greatest joys of birding. This year I set a goal for myself to see a certain number of species, and as I inch closer to my goal it's easy to begin to care more about the number than the birds. I have parulas and gnatcatchers on my list for the year many times over. I don't "need" them to attain my goal. But who could deny that watching them in action is a big part of what makes birding so fun? 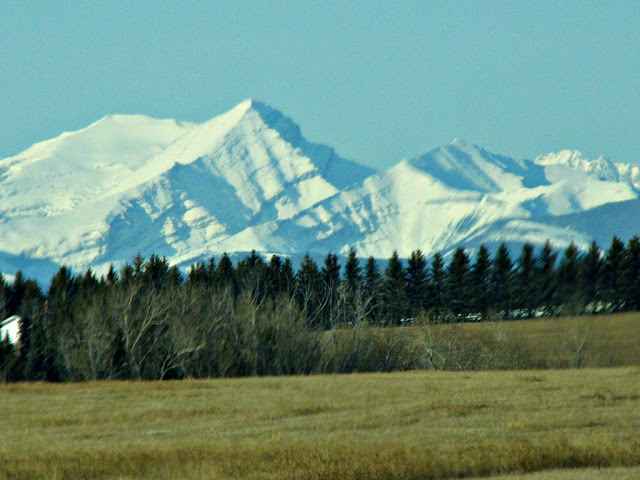 April can be a strange month in Alberta. 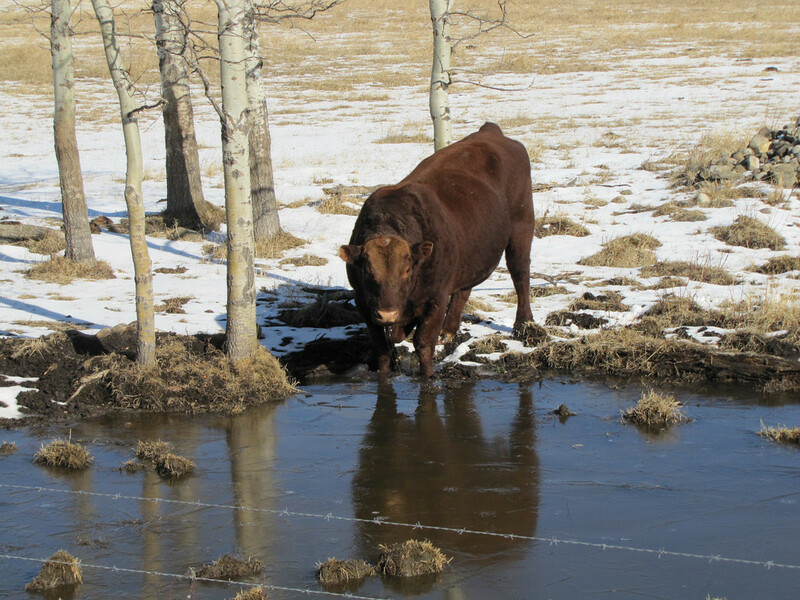 Temperatures and precipitation fluctuate wildly, and it's not uncommon to have a blizzard one day, followed by sun and high double digit temperatures the next. And the birds! Snowy owls, rough-legged hawks, redpolls, crossbills and grosbeaks are still down here on their winter break from the Arctic. 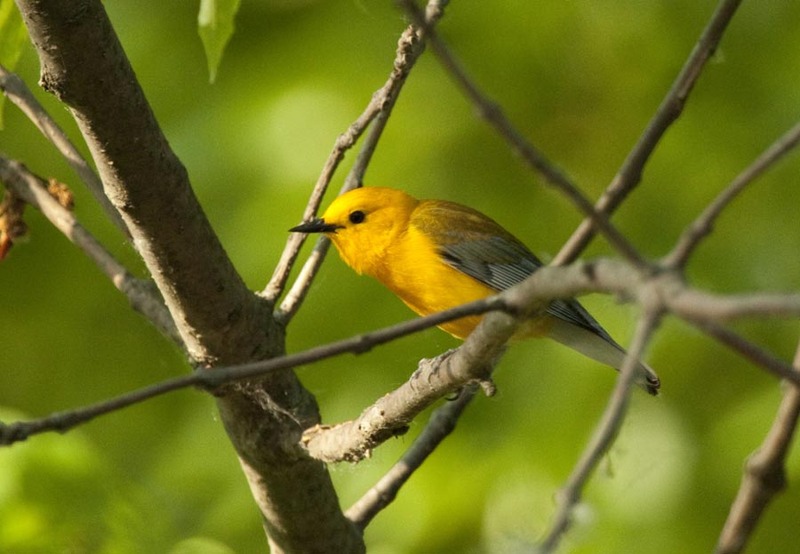 Mountain bluebirds, yellow-rumped warblers, tree swallows, meadowlarks and many more small songbirds have returned from their sojourn in the south, as have the ducks, hawks and herons. Seeing a snowy owl and a Swainson's hawk on the same day is a very cool birding experience! Demands of everyday life have sadly curtailed our birding time lately, which is doubly painful when I read the local bird reports and can't get out to have a look. 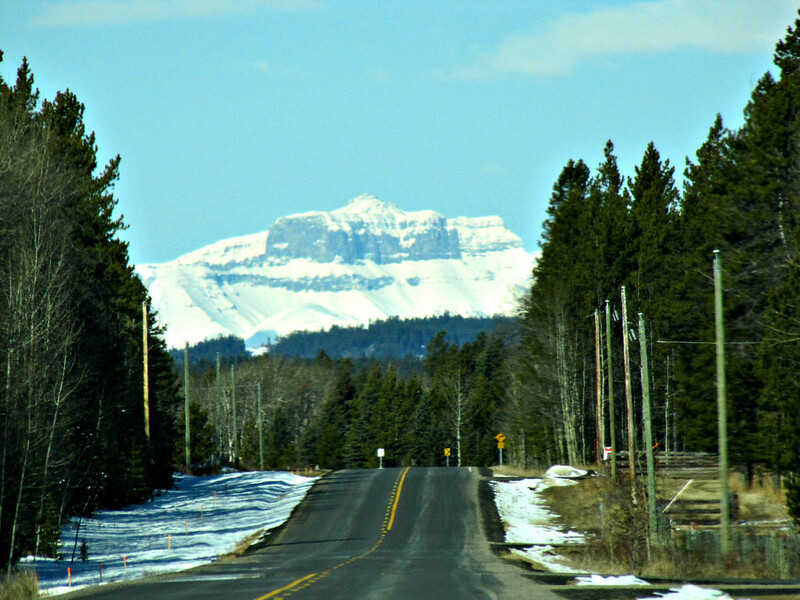 One weekend in mid-month however, we decided to give ourselves a break, and took a quick bird drive on one of my favorite routes. I like this particular drive because of the contrasts. 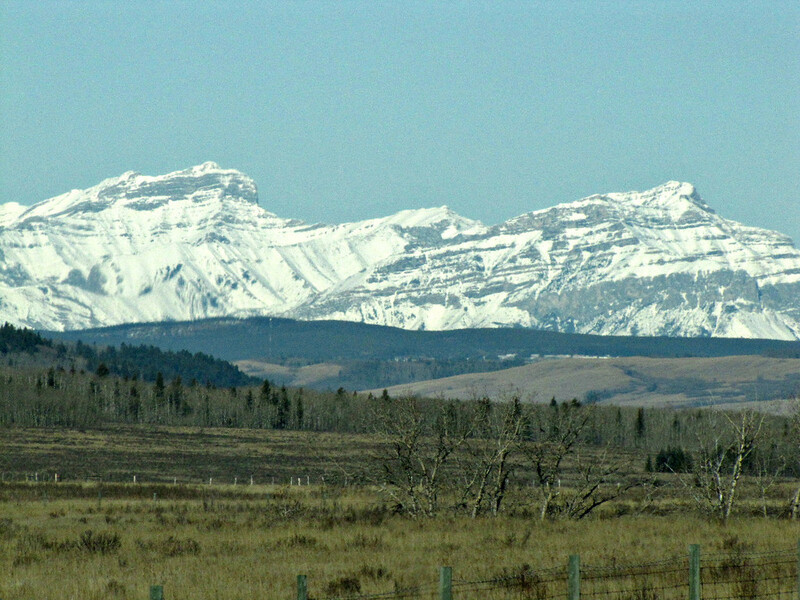 Driving through the foothills where crocuses were popping up, we were accompanied for the first part of the trip by the snow-covered Rocky Mountains on our left. 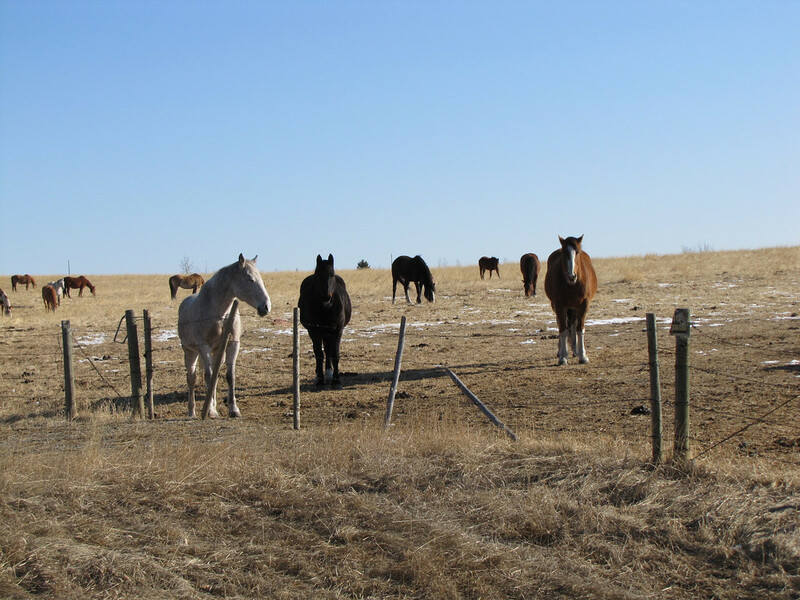 Turning north, ranch fields predominate and we attracted the attention of the local wildlife. Another sharp left turn, and wham, you're in the boreal forest. As a birder, this drive requires a constant resetting of the bird-mode sensor in the brain, jumping from foothills species to grassland species to forest birds. And then you have to reverse the whole process on the way back. Rough-legged hawks were everywhere. They were sitting on fence posts. Perched on top of trees. Stealing the shot from a robin - I only took one photo of the non-raptor bird before I dropped the camera to pick up the binos and ID the hawk. 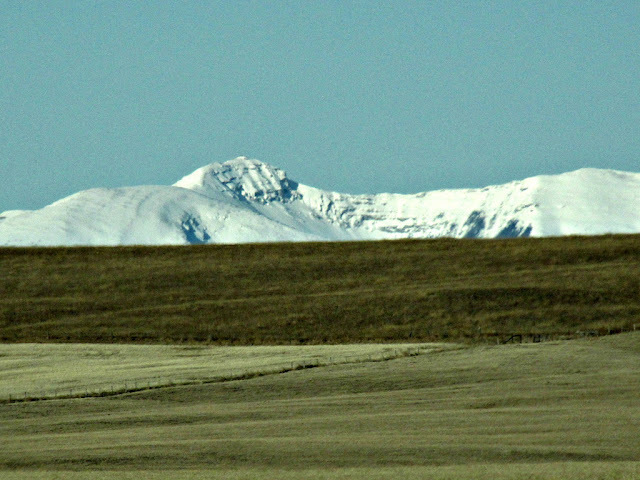 We were out there almost three hours, and counted 31 Rough-legged Hawks. 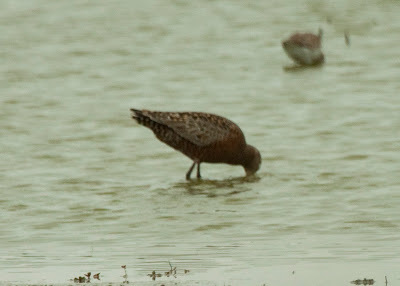 I suspect we managed to hit a day when large numbers of them were migrating north. 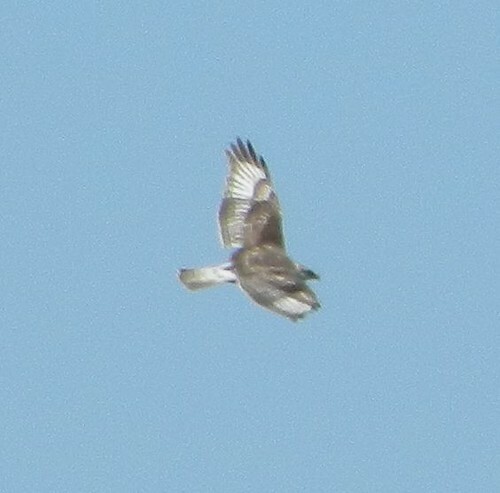 We also identified 8 Red-tailed hawks, and I could still see airborn hawks when I closed my eyes that night. As well as the hawks, this is owl country. 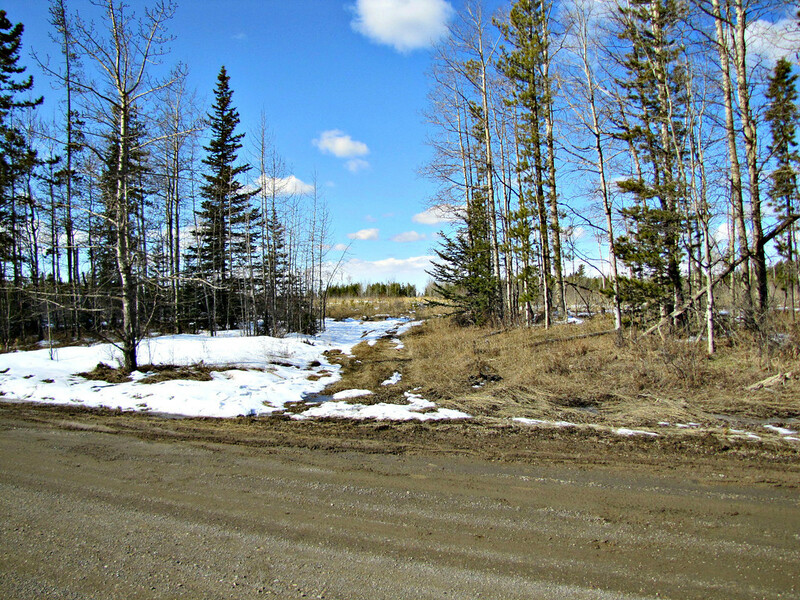 Down this path, across the flat space, nestled in the trees on the other side, I’m told there is a Northern Hawk Owl nest. We hadn't gotten very far when I began to wonder if we were walking on frozen muskeg, as there were ice cracking sounds coming from beneath our feet. Having grown up in the boreal forest, I have a very healthy respect for these soggy water bodies that have a layer of soil on top. People and animals can get trapped and die in muskeg. 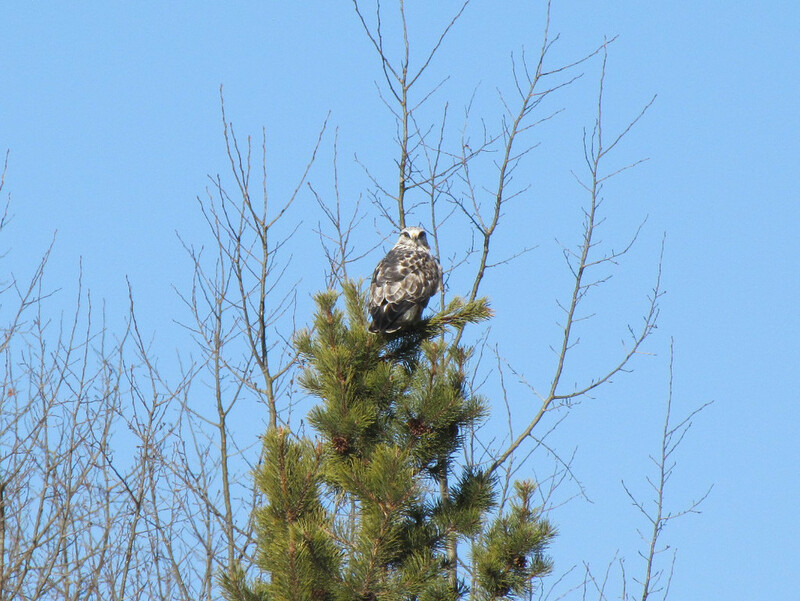 I mentally weighed my options of seeing a hawk owl again vs walking across semi-frozen muskeg. The owl lost. How a local birder found that nest earlier in the month is a mystery, but you can see his wonderful photos on the Birds Calgary blog. 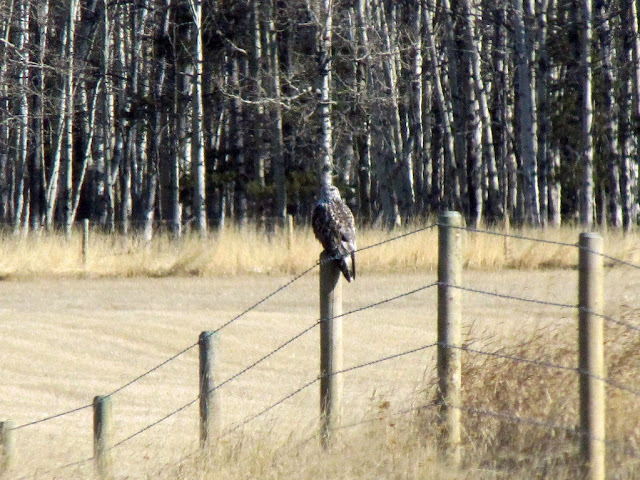 As we were hawk-counting our way back home, we came across this totally unconcerned fellow sitting on a pole right beside the road. He was far more interested in the dead rabbit in the ditch than the mere human taking his (her?) picture, and was still there when we left, resuming our counting. Yep, this is still one of my favourite bird drives! 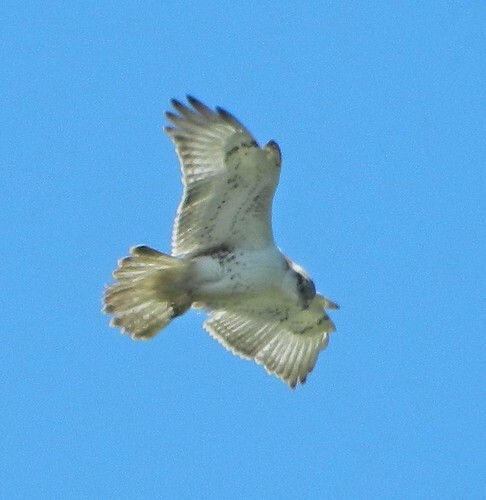 Since some time in February of this year, birders have been seeing an odd Buteo at the Cincinnati/Northern Kentucky International Airport (CVG) in Boone Co., KY. Not much attention had been paid to the original sighting. 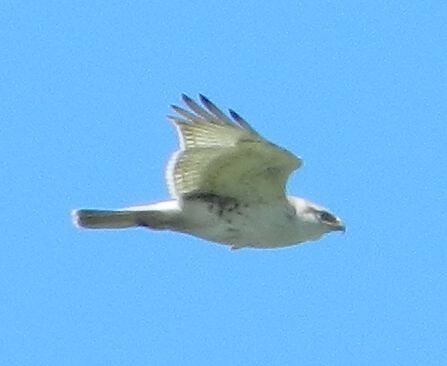 Recently, another birder brought up the suggestion/possibility that the bird was a Ferruginous Hawk. Many birders then descended on the airport and many photos were taken. The bird was definitely a Ferrunginous (immature), a first state record for Kentucky! The Ferrunginous Hawk is a hawk of the western US Great Plains region. From what I have read and heard, it is not so easy to see even in its home range. With the opportunity to see such a cool and cooperative rare bird not so far from me (and somewhere that I know how to drive to! 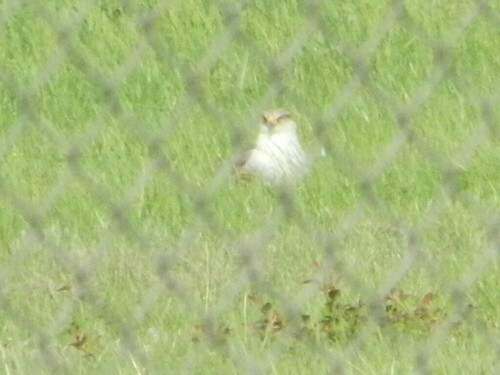 ), I had to go see this bird. 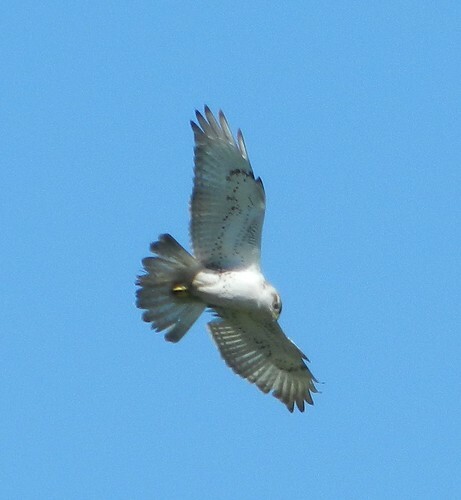 I was off last Friday, so I headed to KY to see the hawk. 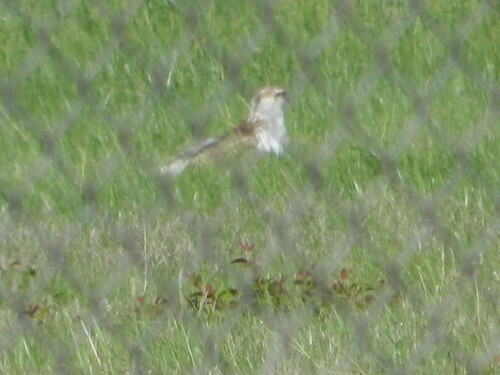 When I first got there, the Ferruginous was laying in the grass just on the other side of a fence that was in front of the plane viewing area. Very easy life bird, but I wanted to see it in flight. The bird stayed on the ground for at least an hour or more. 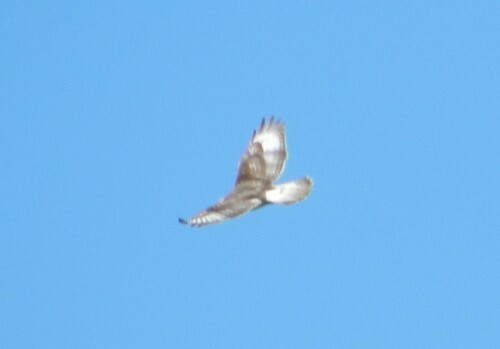 Nope, not a Red-tail! Finally, the bird took off! The back of the bird is very different from a Red-tailed. The Ferruginous would practically disappear with its light coloring and streamline profile. It was very hard to follow with optics. 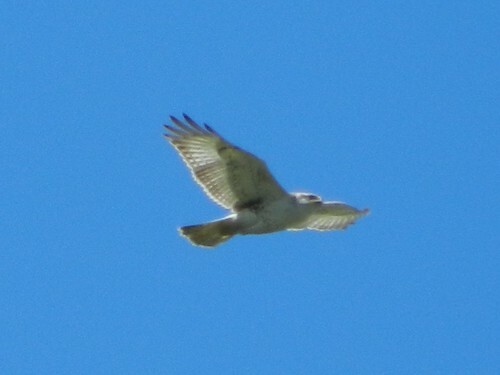 The profile and flight style is different from the Red-tail. 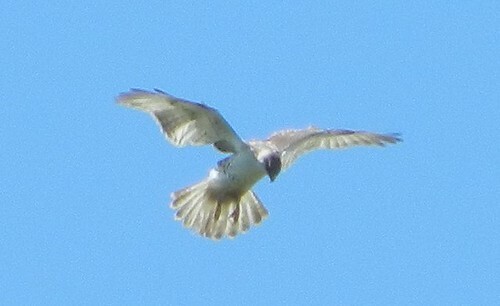 The bird was very fun to watch, as it was more acrobatic than a Red-tail. 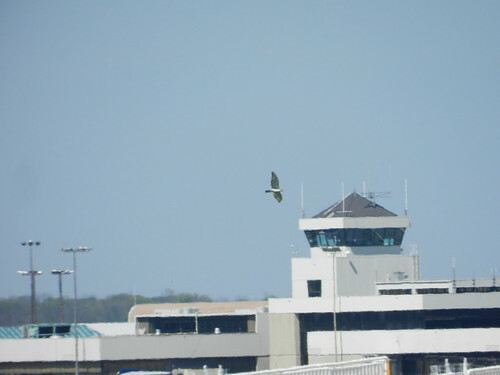 Here is a shot of the hawk in front of the control tower. Only, the hawk didn't take off or land. 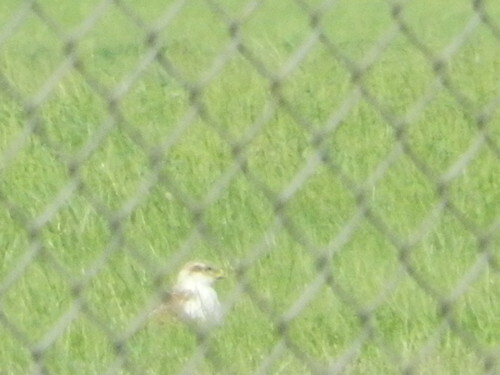 There has been rumors that there are two Ferruginous Hawks at the airport. I do not believe this to be the case. 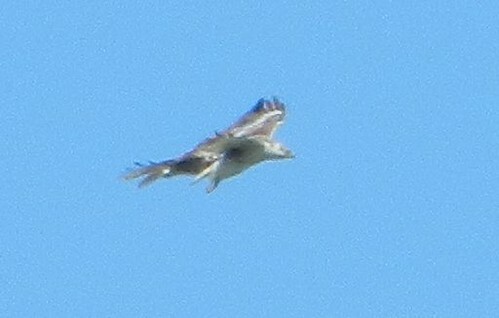 The Ferruginous hawk has been hanging out with a very light Red-tailed Hawk. 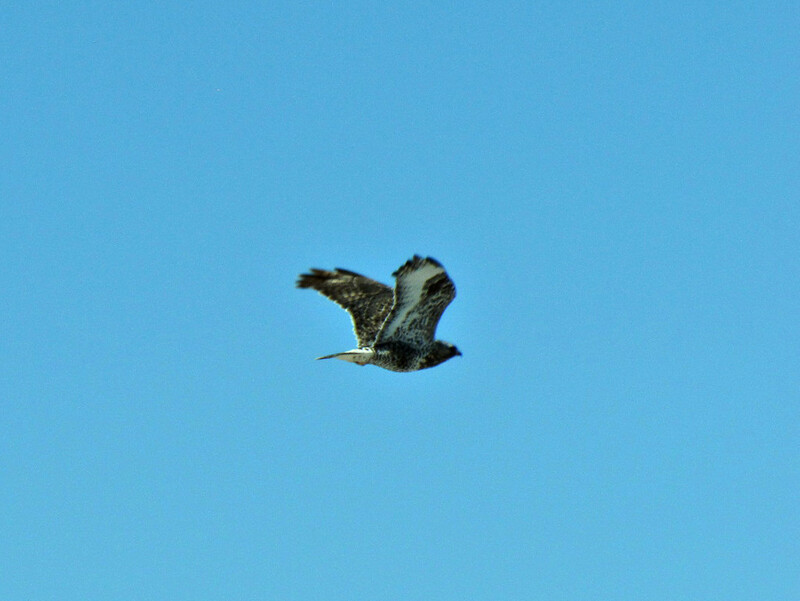 When I was there, the Ferruginous and Red-tail were talon tagging. They had also made wing contact. 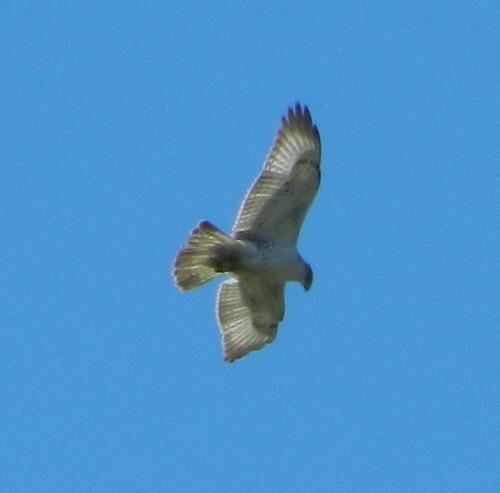 I seen six Red-tailed Hawks at the same time that I saw the Ferruginous Hawk. 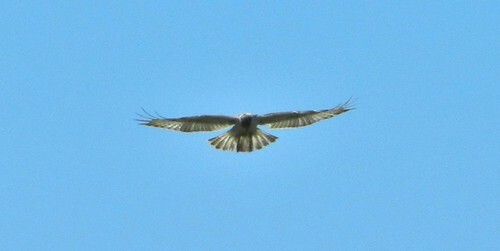 The light Red-tail is on the left and the Ferruginous on the right. 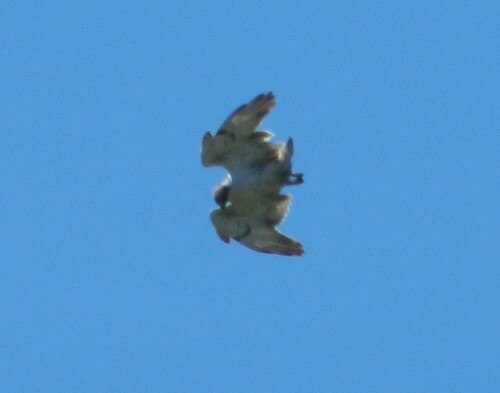 Here, the two are very close together and appear to have touched wings. When the hawk got out of sight, there were plenty of other birds to watch. 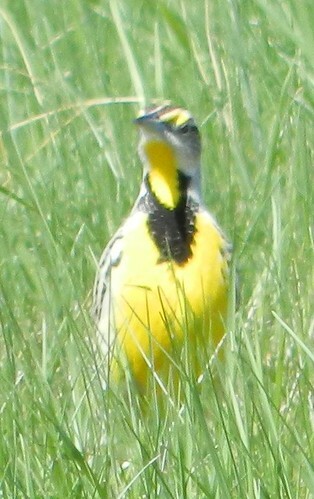 This Eastern Meadowlark landed right in front of everybody as if to say "Hey that hawk has nothing on this!" And, just as I was getting ready to leave and get in the car, the Ferruginous flew right over me! I was able to get these cool shots! Awesome day and bird!